Virtual reality holds the promise of electronically visiting distant places we'd otherwise struggle to reach, but that teleportation-esque ability isn't possible without the right content. YouVisit created a platform that makes it easy for almost anyone to create immersive 360-degree experiences so we can map our lives and see the world through the eyes of our fellow humans. We spoke with YouVisit's head of marketing, Gordon Meyer, to get a handle on the platform and its goals, which center around making content easy to create and view on as many platforms as possible, and providing added depth to photos and videos that you can't get from a framed, still image. The camera never lies, but the photographer does. 360 video is as close to real life as you really can get. YouVisit's goal was to design a simple way to create and share 360-degree content, which they've accomplished as much as anyone can at this time. The available hardware for producing 360-degree videos, both in 2D and 3D, can sometimes pose a bit of a challenge. YouVisit's tools simplify what they can, but until hardware gets smarter, there's going to be somewhat of a learning curve for creators based on what they buy. You can easily snap still images of your surroundings and stitch them together on the YouVisit platform to make a photo that fully encircles the viewer. If you've got a standard or stereoscopic 3D camera, you can use that as well. The platform aims to support as many options as possible to house an incredibly diverse set of experiences around the world. YouVisit can accept 360-degree photos and video footage from most sources, as listed below. Video options range from the consumer-grade, inexpensive Ricoh Theta to Nokia's pro-oriented $60,000 OZO. Their editing tools aim for simplicity, so anyone with a little knowledge of Photoshop and/or iMovie will encounter nothing but a mild learning curve. Some 360-degree camera options (e.g., the 360fly) don't require stitching images together and provide near-spherical video, but they do cause a blindspot patch around the base of the device. Future virtual reality cameras such as Vuze plan to solve all problems with no stitching and zero blindspots, so better tech is right around the corner. Andy Peacock, Head of Content at 360fly, showing off their cameras. Their Experience Builder and content platform set YouVisit apart from other 360-degree video suppliers. The largest sources of this content, at the moment, are Facebook and YouTube, and they can handle both live streams and prerecorded videos. 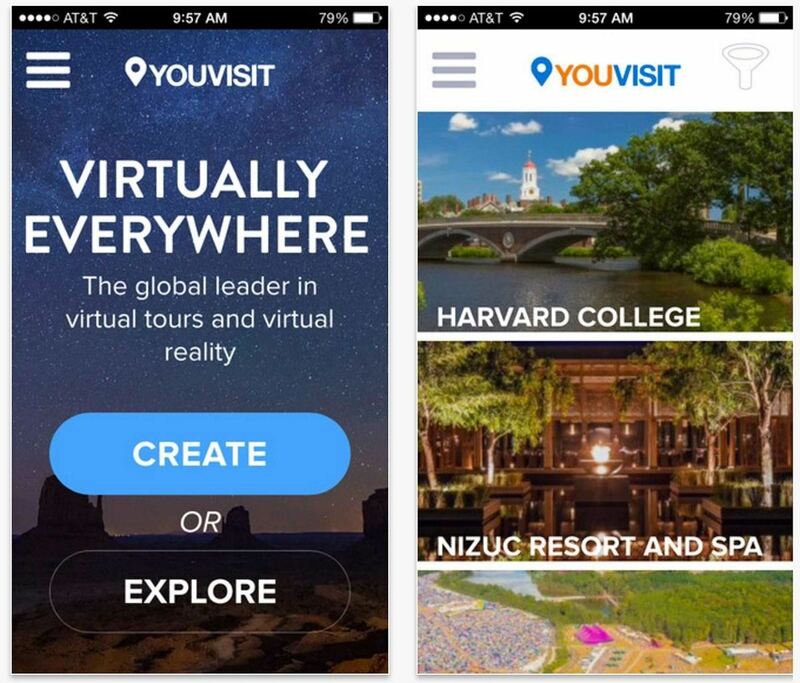 YouVisit might be up against giants, but they're opting for a different kind of network. In fact, you can add 360-degree YouTube and Vimeo videos to their platform. There aren't many competitors in this space just yet, but with Facebook and YouTube in the ring, that's likely to change. As a viewer, YouVisit aims for versatility as well. You can view all uploaded content through a web browser if you're not equipped with a VR headset just yet. But the platform was designed around smartphone users to make things more accessible, so it works well with even just a Google Cardboard headset for a more immersive viewing experience. However, the allure of the third dimension shouldn't detract from the impact of using a web browser on a standard PC. 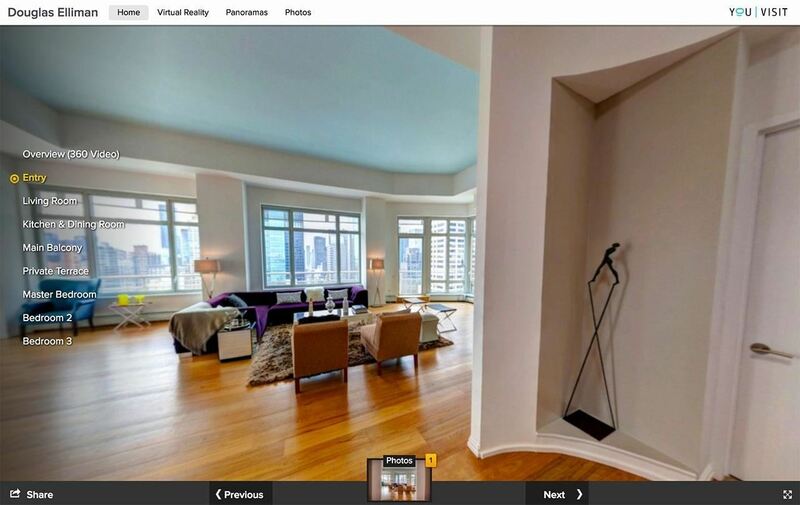 YouVisit handles 360-degree still images with elegance. Because users can upload multiple photos for each location, a handy table of contents floats along with the experience so you can transplant yourself into different areas as you please. Unlike a lot of social sharing sites, the minimal design YouVisit employs not only allows the content to take center stage—something consistently lacking in the majority of user generated video platforms—but gives it a professional look as well. From a business standpoint, you wouldn't hesitate sending an upload to a client. YouVisit works with several brands to create these 360-degree experiences, likely giving them a solid source of revenue that doesn't rely on advertising, so that air of professionalism is likely to stick around. Aside from the novelty of virtually traveling the world, the benefits of the YouVisit platform shouldn't surprise anyone. It has massive applications in education—especially through virtual reality—because you can immerse yourself in another location to learn about it in a variety of ways. For example, a company could shoot a training video from the trainer's perspective so the trainee could get a first person view of the task. High school students can visit colleges without the need to spend money on expensive trips. 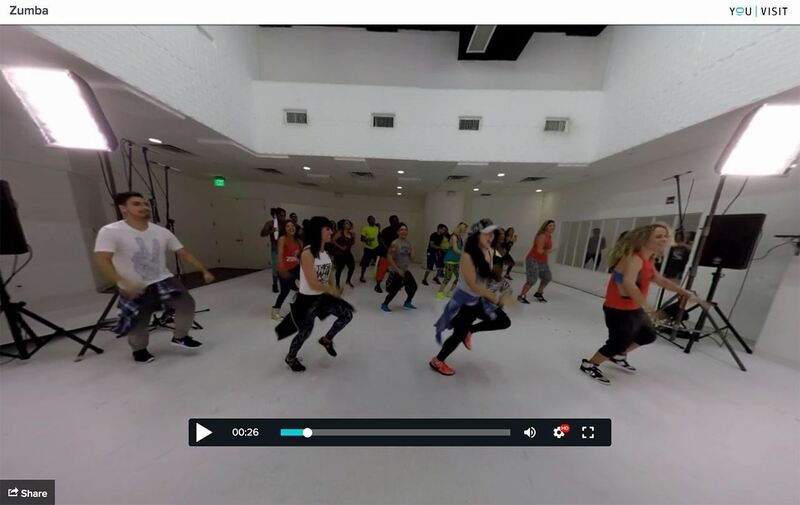 YouVisit even has a 360-degree Zumba class, which might be hard to watch while dancing, but is a great way to see what it's like or brush up on dance moves before the next class. As someone who accidentally ended up adding Zumba to his weekly exercise routine, and basically can't dance, I can attest to its usefulness. Flat, fixed-perspective video can make it complicated to see how certain moves work because angles hide details. When you're right in the middle of the action and can look anywhere your want, you're able to see what you need to see and not what the photographer imposes upon you. That's really what makes 360-degree video compelling: it essentially exists without direction or bias. While you might want that in a film, as we've seen with Adam Cosco's short film "KNIVES", a more open world tends to work better for learning and experiencing something new. It allows you to feel a sense of presence because you control what you see, and presence is pretty much what makes or breaks a good VR experience. If you're not engaged and don't feel like you've actually teleported somewhere new, you lose that sense of immersion that makes this new technology so wonderful. If you haven't noticed by now, there's no barrier to entry with YouVisit. If you're reading this site, you can view their content—and there's a lot of it. If you're so inclined, you can make your own with a still or 360-video camera. It's free either way, so head on over to their site if you want to explore, or download their mobile app if you want to create. It all reminds me of the fun I had making Photosynths back when Microsoft created that platform, but without all the tedious steps and stitching errors. YouVisit is fun, educational, and absurdly easy to use. In the future, Meyer tells us the platform intends to support even more content sources and viewing options with additional interactivity. If 360-degree video interests you, their content, software (Android, iOS), and overall platform are not ones to miss.